Hi folks, Doc here. 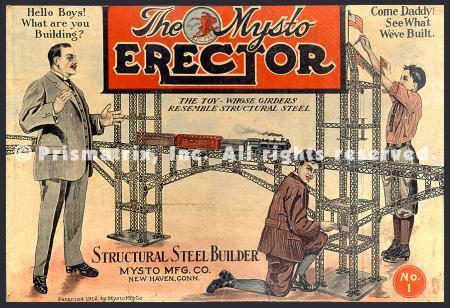 This time we'll look at one of the earliest Erector sets, the Mysto Erector No. 1 from 1914. 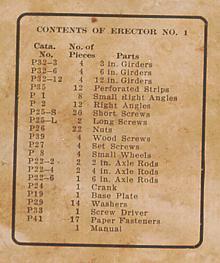 In that year, only the second year of Erector production, Gilbert made significant changes to the No. 1 set, including all new artwork on the box and instruction manual. 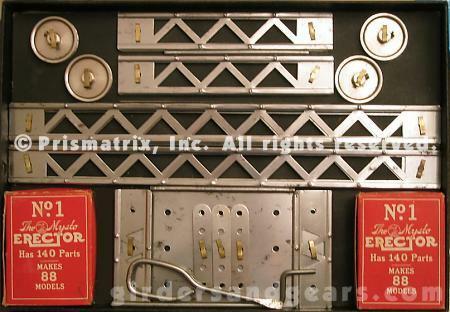 In addition, both the girders and the pulleys found in the set were redesigned and improved. The No. 1 was a small set (only the No. 0 was smaller) with just 140 parts, although as advertised it could be used to build 88 different models. It was packaged in a flat cardboard box that measured 12" long by 9" wide by 1" tall. 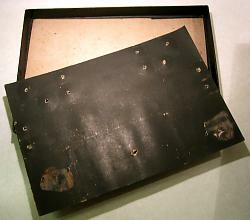 The box lid slipped over the bottom like a shoebox; both pieces were covered with a heavy black textured paper. A large full color label depicting a man watching his sons build an enormous railroad bridge was pasted on the outside of the box lid (see below). A small parts inventory sheet was pasted on the underside of the lid. 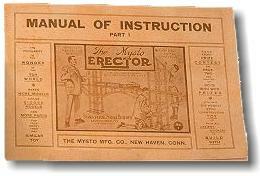 The instruction manual, shown above, was slightly smaller than the previous year, and was printed in brown ink. The models inside were illustrated rather than being shown in photographs. Inside the box the new and improved girders and pulleys, plus perforated strips and a base plate were secured to a flat cardboard insert with "paper fasteners" (t-clips). Screws, nuts, and other small parts were stored in two red cardboard part boxes. The particular set shown in this feature is somewhat unusual in that it has never been used. The box and all the parts are original; the box is in remarkable condition, given that it is nearly 90 years old. 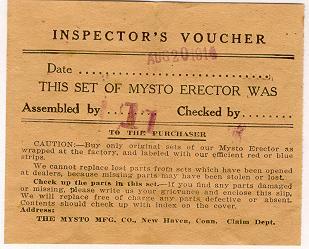 The parts, on the other hand, although mostly bright and clean, were peppered with rust spots when I acquired the set. This was particularly true where they were in contact with the insert or with each other, having spent decades clipped in place and stored away. A damp cloth took care of the box, inside and out, but the parts needed a bit more work. I used my now favorite technique of chrome polish and 4-0 steel wool on them, and brought them back to nearly new condition, although some residual black staining remains here and there, as is usually the case.